Malaria puts a huge strain on public health and the economy in Nigeria. In addition to costing the country approximately $1 billion a year, the disease causes thousands of deaths and stretches the health system, sometimes beyond capacity. Malaria is responsible for approximately 60 percent of outpatient visits to health facilities and accounts for 30 percent of child deaths. The Nigerian government aims to reduce malaria burden to pre-elimination levels and brings malaria mortality to zero. Since 2008, Malaria Consortium worked to reduce the malaria burden in Nigeria through the Support to National Malaria Programme (SuNMaP). Funded by UK aid from the UK government, the programme assisted the Nigerian government to control malaria through a number of prevention, treatment and health system strengthening strategies, such as insecticide treated net and antimalarial medicine distributions, planning, harmonisation, capacity building and research. Malaria Consortium, in all of its work in Nigeria, collaborated extensively with the government as well as donors, the commercial sector, non-governmental organisations and civil society groups. By delivering and scaling up key interventions, SuNMaP helped to ease the health and economic burdens that malaria poses on the Nigerian people. 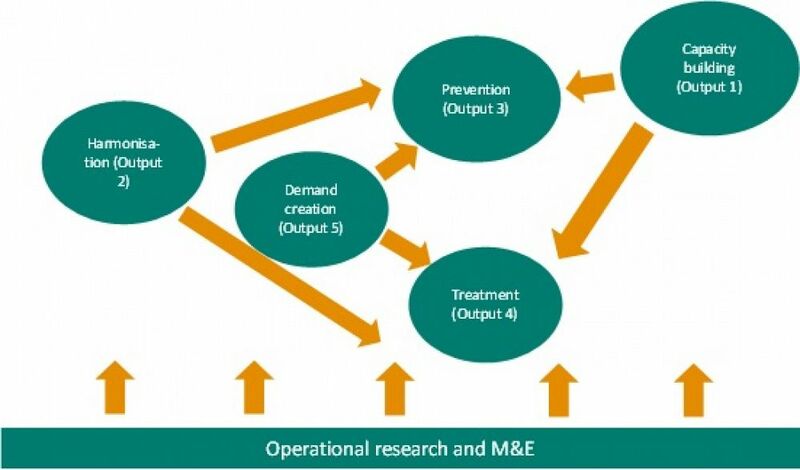 The SuNMaP programme focused on six elements that are central to malaria control and elimination: capacity building, harmonisation, prevention, treatment, demand creation and operations research. Each of these areas encompassed a range of activities that strengthen the public health system in Nigeria and form a cohesive strategy that contributes to the reduction of malaria. Below you can find out more about our key takeaways from each of the six areas – our experiences, what we have learnt, and what these lessons mean for malaria control in Nigeria. Capacity building was at the heart of the SuNMaP programme. Looking beyond training, it sought to increase the knowledge and skills of those working at all levels of the healthcare system to fight malaria. This meant improving service delivery systems, financial and programme management, and strengthening institutions through better planning, delivery of quality services and performance management. Watch our video on capacity building to learn more. Harmonisation meant supporting the NMEP in harmonising the resources and capacity of all partners (both local and international) for maximal use and to forestall duplication and wastage. Under this output, the programme also sought to coordinate its activities, including working with all tiers of government, agencies and stakeholders in both the private and commercial sectors. Key to any malaria control effort is prevention and treatment interventions. This means distribution of insecticide treated nets, the provision of preventive therapies for pregnant women and seasonal malaria chemoprevention to children aged 3-59 months in the Sahel regions, and a constant supply of malaria diagnostics and artemisinin-based combination therapy drugs for quality malaria case management services. In order to reduce the burden of malaria on communities, there must be sufficient use of malaria interventions and demand for more and better services. SuNMaP built malaria awareness through advocacy, communication (electronic, print media and interpersonal) and community mobilisation efforts, and improved market systems to increase access to antimalarial commodities in the retail market, in an effort to make them more affordable and increase demand. The evidence gathered by SuNMaP demonstrated the impact of its projects and helped improve programme implementation within the context of the national monitoring and evaluation framework and the National Malaria Programme’s operational research agenda. First, this meant monitoring and evaluating current and past interventions, learning what worked and what did not, and applying these lessons to future projects. Secondly, research questions were generated from programme lessons and a variety of operational research studies were conducted.